The holidays are just around the corner and ‘tis the season for hosting. Whether it be impromptu gatherings with friends, a holiday dinner for the whole family, or weekend house-guests, we know you want your home to look its best. Here are a few of our favorite tips to get the hub of your home in shape for the holidays. It’s easy to fall in love with a bunch of design aesthetics…we know, we’re in the business! Many work well together but it’s also easy to get carried away and end up with a disjointed collection of home furnishings and decorative accessories. So find your personal style (or a blend of complimentary styles) and weave them throughout your home. As you travel from room to room, these thoughtful design details will create a unifying theme and add character throughout. Nothing says, “come, stay awhile!” better than a warm and inviting room. Area rugs, accent pillows, and woven throws are not only inviting but they add color, texture, and pattern to your space. Anchor your room with the right rug and throw pillows and everything else will fall into place. From task, table, and floor lamps to ceiling fixtures and wall sconces, the lighting you use throughout your home plays a major role in your aesthetic. Designer lighting in distinctive finishes adds high style and functionality to any home. Incorporate candles, hurricanes, and votives throughout and embrace the glow of a well lit home. A focal point like a centerpiece tray with a large format candle or a handful of votives, and seasonal elements placed on a coffee or console table instantly adds interest and is a great seasonal design-solution. It can be used all year long and easily updated by swapping out a few elements. Shop our centerpiece collection for more ideas. Natural elements like decorative florals, ferns, and succulents add texture and color to any space. From a small potted plant on a bookshelf or accent table to larger statement pieces like a white orchid or succulent garden on a coffee table, bringing in botanic elements provides natural warmth to your home. Your home should reflect your personal style, share your memories, and commemorate your travels. 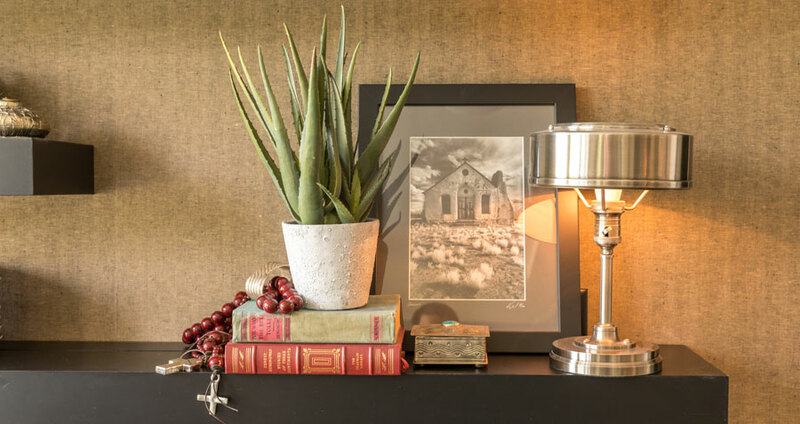 Displaying personal elements like framed photographs, personal keepsakes, and travel mementos is not only a great way to accessorize your space but serve as great conversation pieces. Let Homefest help you create the perfect living space. Shop our collection of decorative accessories and home accents online or visit us in-store and let a sales associate guide the way.